Our Management Fee is dependent on the plan that you select. The Leasing-Only Plan obviously does not warrant a Management Fee. For Full Service, we charge 10% of rents collected every month and for Premium, we charge 12% of rents collected every month. We do not charge any vacancy fees. We only receive a fee when we collect rent from your Tenant. Like leasing fees, property management companies in Central Indiana charge different types of management fees. Some use a percentage of rent collected like we do, while some charge a flat rate per property. What Does a Management Fee Cover? 1) Collecting rent and disbursing those net proceeds, monthly, into your designated bank account. 2) Providing monthly statements that show your income and expenses. In addition, your management company should provide a year-end statement along with a 1099 for tax purposes. 3) Handling the day-to-day activities that may accompany your property, including any HOA complaints, roommate disputes, etc. There’s a whole list of items involved in the day-to-day management of a property. 4) We handle any and all maintenance issues on the property so that you don't have to, including emergency and after hours calls. 5) Obviously, there are other value added benefits that a management company may provide to earn its management fee. For example, we conduct detailed move-in and move-out walk-thrus for all of our properties. While this does take additional time, the reports prove to be very valuable when security deposit disputes arise. 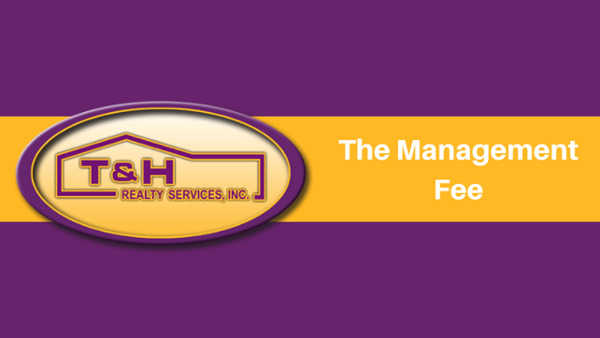 The biggest way a management company earns its fee, in my opinion, is by making itself available 24/7 to handle any issue that may arise with the home. It creates peace of mind knowing that your property is being managed by a professional organization, who should be able to handle any issue at any time. Providing a service like this is expensive. A well-run property management company has an enormous amount of overhead, including multiple insurance policies, licensing, company vehicles, technology, staffing, and office space. If you have any questions about our management fee, please don’t hesitate to contact us.